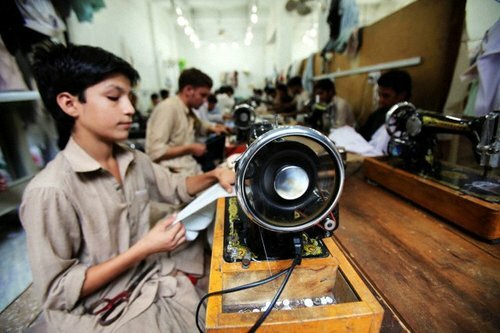 Karachi: The rights of textile workers in Pakistan go neglected and all the stakeholders including government should take steps to address their issues, said Nasir Mansoor of National Trade Union Federation Pakistan (NTUF). He said Pakistan is one of the leading Textile and Garment (T&G) exporting countries and millions of workers are engaged in different sectors of textile from cotton fields to readymade garment industries. The main markets of Pakistani products are European Union and North American countries. He said Pakistan has been granted an especial status of General Schemes of Preferences Plus (GSP+) by European Parliament from 1st January 2014-04-04 for ten years. The GSP+ is an especial status which means that the 9.5% duty on 23% of total Pakistani textile and garment exportable products to EU will be waved off which would result in increase of export to European market. It is estimated that after granting of GSP+ status the export earnings will be stand at 10billion Euro yearly and nearly one million new jobs will be created in textile and garment sector. He said one of the most important components of GSP+ mechanism is the observance of 27 international conventions on human and labour rights in real term at workplace which have been grossly neglected and violated in past. The governments along with employers of textile and garments sector have made commitment through GSP+ instrument to implement the core conventions of International Labour Organisation (ILO) at workplaces. He said, however, the textile sector workers work under worst exploitative conditions without any right of social security, minimum wages, lawful working hours, right to form union and bargain collectively, old-age benefits and occupational health and safety mechanisms. He said NTUF being the vocal voice of worker rights at federal level is going to organize a one-day All Pakistan Textiles, Garment & Leather Workers Conference on Monday, 14th April 2014 in Karachi, which will be participated by more than 200 textile/garment & leather workers representatives and human rights/union activists, labour experts and researchers to set the national agenda of the workers for implementation of labour standards at workplace and for better living conditions in back ground of GSP+ mechanism.